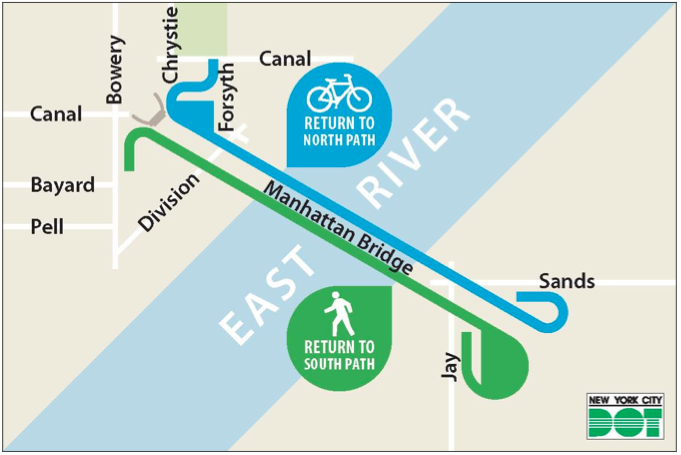 Due to construction on the north path of the Manhattan Bridge, cyclists and pedestrians “swapped” paths in July 2011. This temporary swap/detour will end on March 5, 2012. Effective March 5, 2012, cyclists will return to the north path and pedestrians will return to the south path. Construction work will transition from the north to the south side of the bridge, so some construction sheds will remain in place for several months. On-street bicycle detours and pavement markings will be removed beginning March 5, 2012. It sounds like there will be a bit of a squeeze under those construction sheds, so be courteous to your fellow bike commuters as you pass. The good news is that cyclists will once again enter Manhattan via Forsyth Plaza and Christie Street, which is a far more pleasant how-do-you-do than the Bowery. Savor the view on the ride home tonight, because it’s the last time you’ll get to see it until the next cable replacement job about fifty years from now. If you ride via the Manhattan Bridge, be sure to stop and say hello to Transportation Alternatives volunteers who will be alerting cyclists to the switch on Monday morning.